It’s a friendly dual, but come on, two years in a row? That’s a winning streak worth talking about. 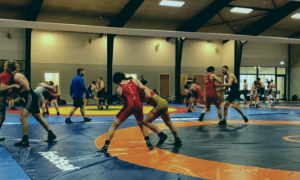 Earlier today in Klippan, Sweden, a US squad powered by the likes of Britton Holmes (70 kg, NMU/OTS), 2018 Cadet World Teamer Dominic Damon (65 kg, WA), Ryan Cummings (72 kg, NMU/OTS), and Olympic Training Center athlete Nick Boykin (104 kg, Sunkist) overtook Team Skåne Brottning for the second consecutive year. 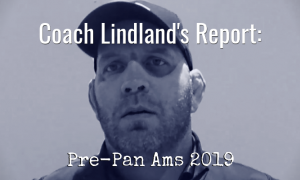 Tyler Curd (104 kg, NMU/OTS) got it all started for the US by prevailing over Linus Persson (TSB) 8-0. Curd wailed a nice lateral early in the first and grabbed subsequent exposure points before sealing the bout a minute later with a bodylock on the boundary. 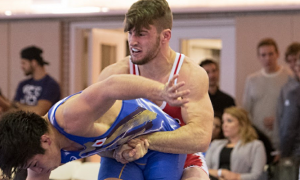 David Stepanian (60 kg, NMU/OTS) was next opposite Fabian Frisk (TSB), and he, too, scored a tech victory. It went on like this for the next four matches, as the American age-groupers rattled off six straight wins. Damon was opening up on Samuel Trellid (TSB) in the the second period when that bout was stopped due to an injury for Trellid. 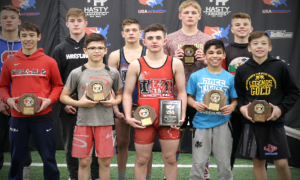 Then Logan Hatch (66 kg, WI) delivered a fall in the proceeding bout against Max Scharenfort (TSB). Noah Wachsmuth (70 kg, OR) required all of :44 to take care of Zacharias Gustavsson (TBS, who was filling in for an injured Armando Molin). The rally concluded with Holmes, one of NMU’s most vicious all-around competitors, and he needed barely over a minute to come away with a pin over Fabian Mazdin (TSB). 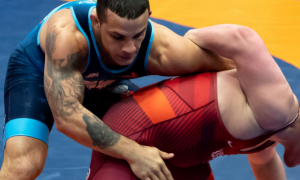 The team race was already out of reach by the time Boykin stepped on the mat to face Persson, who was competing in his second bout of the afternoon. With his new, leaner frame, Boykin showed a slicker element to his game. 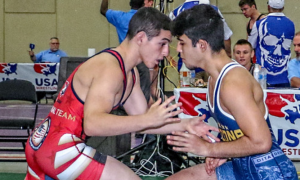 He was creating more angles against Persson and zeroed in on a pair of solid body attacks en-route to a 12-4 tech win that wrapped up the dual. In 2017, the USA/Team Skåne Brottning dual was not a runaway. Damon clinched the team win for the US when he tech’ed out Gustavsson. 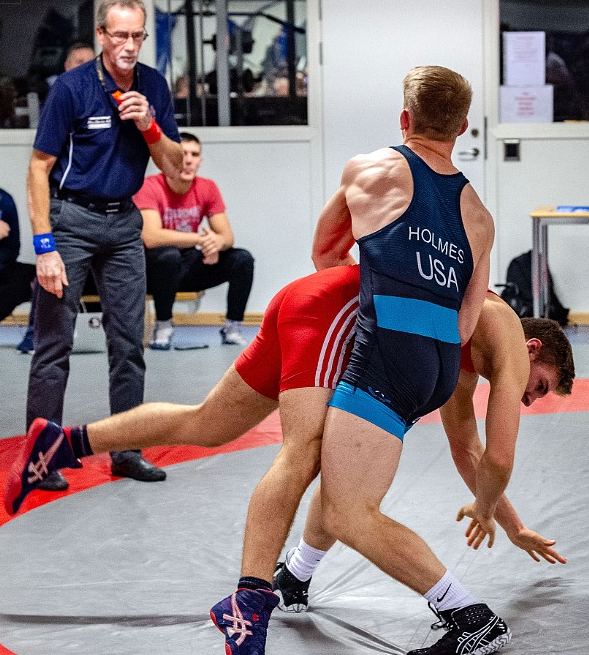 Like last year, the 2018 dual meet between the US and Team Skåne Brottning was streamed live on TSB’s Facebook page. 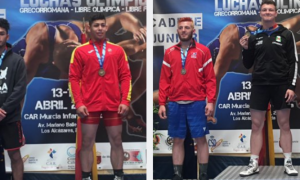 Tommy Dantzler (82 kg, Front Range Twisters), former US Olympian TC Dantzler’s son, was turned back by 2018 Nordic Championships silver Anton Olsson (TSB) 14-5. Although, Dantzler had his moments in this one, including a blast high dive that scored four in the second period. 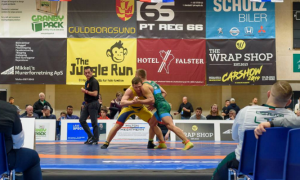 NMU’s Ryan Cummings (72 kg) is now 2-0 in USA/Sweden duals. Cummings squared off with Alex Beck (TSB) and piled up a 15-4 tech fall. The US delegation is set to remain in Sweden and will next head to Västerås in advance of this coming weekend’s Malar Cupen.